Interstate 135 (I-135) is a 95.7-mile-long Interstate Highway in central and south-central Kansas, USA. I-135 runs between the cities of Salina and Wichita. The route also runs through the cities of McPherson, Newton, and Park City. 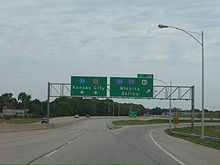 The interstate's northern terminus is at the junction of Interstate 70 and its southern terminus is with Interstate 35 (the Kansas Turnpike). The highway was designated as Interstate 35W until September 1976, when it was renumbered as I-135 to conform to new AASHTO policies that eliminated most suffixed Interstate highways. It is the longest 3-digit "spur", with an odd first digit, in the Interstate system. I-135 begins at this exit from the Kansas Turnpike. I-135 ends at this interchange with I-70, US-81 continues north. I-135 begins from the south at Exit 42 on the Kansas Turnpike. (The exit is signed as I-135, I-235, US-81/Wichita/Salina.) US-81 joins I-135 half a mile later, and remains concurrent with it for the rest of its length. Less than a mile from the Kansas Turnpike tollbooth, I-235, a loop around the western side of Wichita, branches off the highway. I-135 continues northward from there, running just east of the Wichita downtown area. It reunites with I-235 at Milepost 11 at the loop's other end. I-135 leaves Wichita and continues northward to Newton where it turns northwest around milemarker 33. The freeway continues in this direction for 20 miles (32 km), returning to a due north course at McPherson. The stretch of I-135 in Saline County from the Saline-McPherson county line to the highway's terminus at Interstate 70, is designated as the Ben E. Vidricksen Highway. The route ends on the northwest side of Salina, at its intersection at I-70. The road continues as US-81 north of this interchange. Construction on the Canal Route portion of I-135 (in Wichita, where the Chisholm Creek Canal runs through the median of the highway) was begun in 1971. This portion of the route took eight years to complete with a cost of $32 million. Originally, the northern terminus of the highway at I-70 ended as a trumpet interchange. When US-81 was upgraded to a freeway between Salina and Minneapolis, the northern terminus was rebuilt as a full cloverleaf interchange, which remains to this day. Until September 13, 1976, I-135 was signed as I-35W. The Interstate's full length was completed in December 1979. 0.694 I-35 / Kansas Turnpike – Oklahoma City, Kansas City Southern terminus; Kansas Turnpike toll booth; I-35/Kansas Tpke. exit 42; trumpet interchange. 1.312 1C I-235 north I-235 exit 1A southbound, to 135 north; tri-stack interchange. 154.075 95A-B US-81 north / I-70 / US-40 – Concordia, Topeka, Hays Northern terminus; north end of US-81 overlap; signed as exits 95A (I-70 east) and 95B (I-70 west); I-70 exits 250A-B; freeway continues north as US-81 (Frank Carlson Memorial Highway); cloverleaf interchange. ^ "Shortest and longest 3-digit interstates". ^ a b "1970s". Kansas Celebrates 50 Years of Interstates. Kansas Department of Transportation. Retrieved 2011-09-21. ^ a b c "Canal Route on I-135". Kansas Celebrates 50 Years of Interstates. Kansas Department of Transportation. Retrieved 2011-09-21. This page was last edited on 17 March 2019, at 18:38 (UTC).